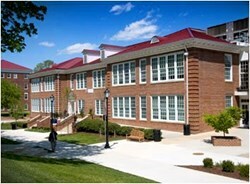 Longwood University will launch Virginia's first online MBA in real estate in fall 2014. This fast-paced field is changing and becoming more technical, and we’re trying to provide education so people can advance in their careers. Longwood University is launching an online MBA in real estate. The part-time program, expected to take two years to complete, will enroll its first students in fall 2014. It is geared to the commercial real estate industry and will prepare students for several professional certifications. “This is probably the only online MBA program in real estate in Virginia and one of only a few online real estate programs in the country accredited by AACSB,” said Dr. Scott Wentland, assistant professor of economics in Longwood’s College of Business and Economics (CBE). Longwood’s online graduate programs in business recently were ranked among the best in the country by U.S. News & World Report. Wentland, Dr. Xun Bian, Dr. Ray Brastow and Dr. Bennie Waller have collaborated on several published real estate research studies in recent years and will bring that expertise to the new program. “We’re expanding in an area in which we have strength,” said Wentland. Longwood’s MBA programs also include concentrations in general business (both part-time and full-time) and retail management (part-time), all of which also are offered online. Students, most of whom work full time, like the flexibility provided by the online model, said O’Connor. MBA students also like the extended weekend residency on campus every summer, which provides an opportunity to “get to know their professors and to network with other students,” said O’Connor. Longwood’s online graduate business programs were ranked 62nd nationally, among 239 such programs, by U.S. News & World Report in its 2014 rankings of various online college programs released Jan. 8. Only one Virginia school ranked higher than Longwood. The most important factors in the rankings (http://www.us.news.com/online) were student engagement, faculty credentials and training, and student services and technology. Longwood’s College of Business and Economics is accredited by the most prestigious accrediting agency for schools of business, AACSB International.